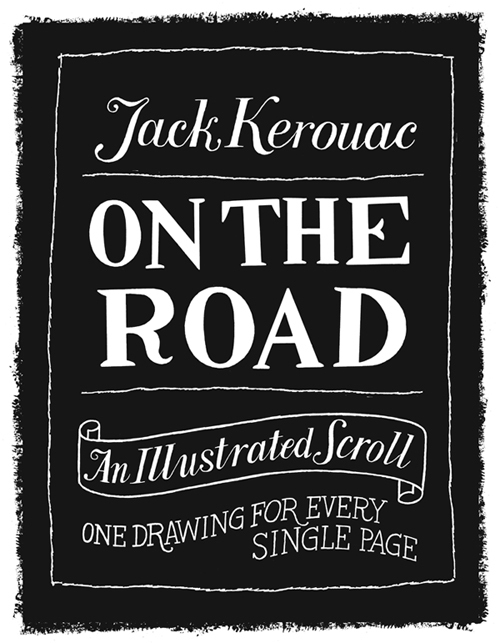 This is the final installment of the Illustrated Scroll of Jack Kerouac’s novel “On the Road.” I started making one drawing for each page of the book in 2012 and reached the end at page 309 a few weeks ago. Something that started out as a little side-project got a lot of attention online and has been re-posted many, many times. I’ve heard from Kerouac fans from around the world and the drawings have been featured in magazines in the US, England, France and Spain. Many people have written me kind notes about the project and a woman from Lowell, Mass. wrote to tell me that her grandmother had a crush on Kerouac when they were in the same high school typing class. Last month, Paul Slovak, editor at Viking Penguin called to see about publishing the drawings as a book. He had some great ideas about packaging and design and it looked like it was going to be in stores next fall, but we got some bad news from the Kerouac Estate. They decided not to grant permission because they feel that the project “detracts from the book,” is a “dumbing down” of On the Road, and “diminishes the aura” that the novel possesses. We disagree, but it seems the Estate has made up its mind about it. It’s disappointing, but you never know, these things have a way of finding their own time, and maybe something else will come along down the line. It's been a fun ride.